Strips cut, glued back together, 12 hull panels cut to shape and run through the thicknesser. With a bit of luck they should look more like a boat than a heap of wood cut into odd curved shapes 60 mm high on the bench. Let the fun part begin!!!!!!!!!!! Just about ready for a test float. A couple of coats of resin, then widen the graphite on the bottom. Seems to be too narrow to my mind. Weighed in at 40.48lbs/18.4kgs without the seat fitted. Seems strong enough. Paulownia does weigh light. Can hardly wait. 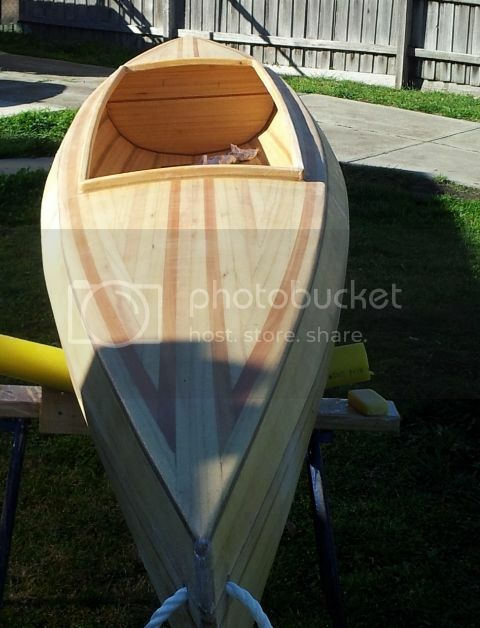 Will test drive and then do the hatches, fit out anchor trolley, rod holders and then varnish. What can I say but "Maaaaaate!" 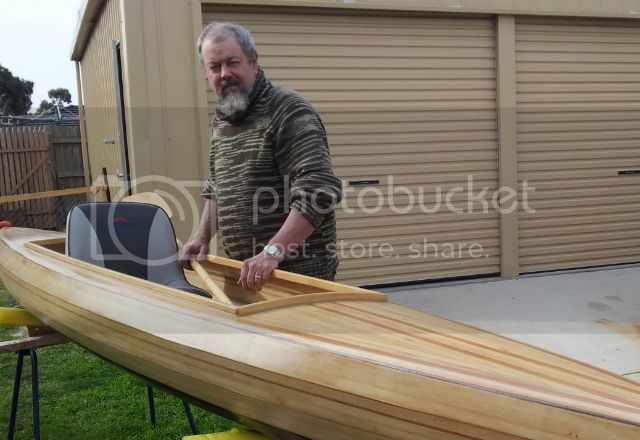 Very neat job there John, will look fantastic on the water. Brace yourself for some extreme cases of carpark syndrome - there'll be so many people wanting to ask about it that you'll have trouble getting to the water. Must say you look younger than I expected too. Since I've recently become unemployed, one would hope they may be requesting to have one built for them at some exorbitant price. 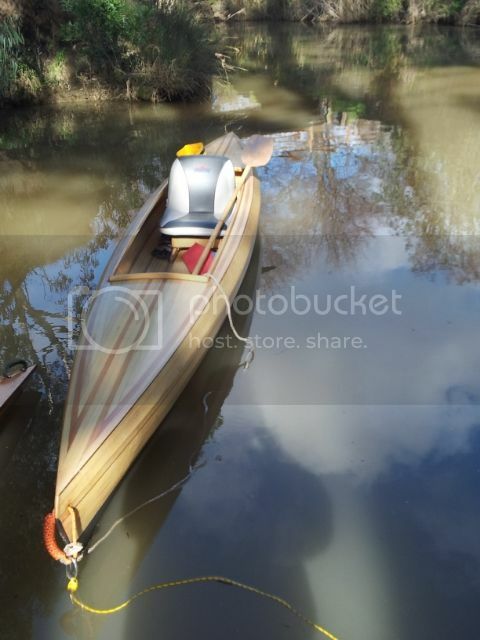 Bit of a scare factor there, carefully lowered the grandson into the boat on the stands to see if there was any flex with the Paulownia. 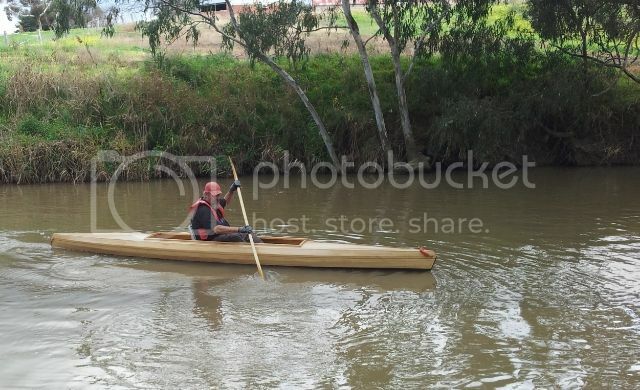 Was very good, he could walk up and down the cockpit, shift the seat with no sign whatsoever of flex in the boat. 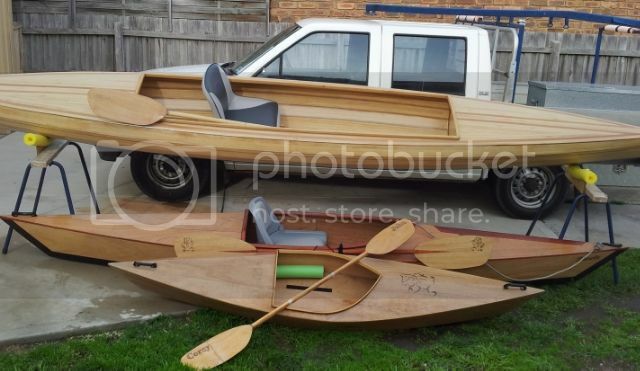 Sorry mate can't really help you much, this is only the third boat I have made. 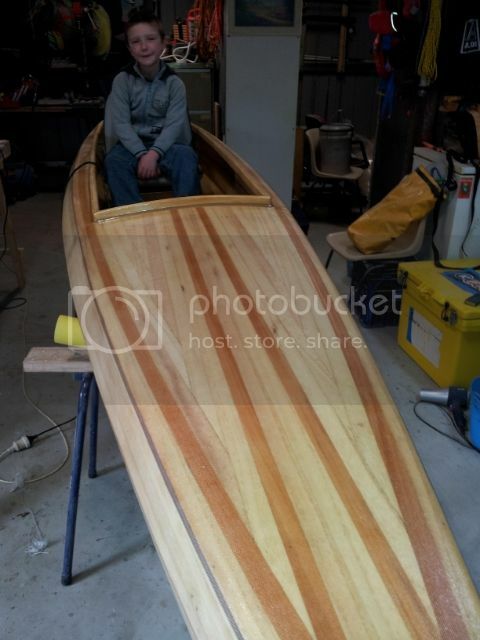 As you can see a plywood S&G Laker, a homegrown 7'10" S&G Laker/pirouge type thingy in ply for the grandson and the Northwind. So as you can see I am just starting to learn about SS&G. A timber place here was going to chase some redwood posts that i may have used but decided to go with Paulownia and a mate had some spare WRC he is making a Freedom 15 out of, so I went with that. There will be someone else on the forum that may know more about timber than me(not hard). had a reweigh of the boat before the test paddle, bare weight has come up to 45lb12oz. No doubt will gain a bit more when the hatches are in but I don't think it will go over 50lb. And am totally happy with it. Was empty on the day so was a bit tippy but 1st and 2nd stability made me feel totally safe in it. Moves along surprisingly well. Loves a straight line, not so fussed about turning. No doubt I just need to learn about that. Glides well. Will proceed to fit the hatches and rod holders asap and then get it out on some bigger water with a bit more room to turn and a load of fishing gear to stablise it a bit.